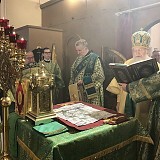 From Monday the 22nd through Wednesday the 24th of October, the triennial Eastern American Diocesan Assembly was held at the Diocesan Center at St. Alexander Nevsky Cathedral in Howell, NJ. 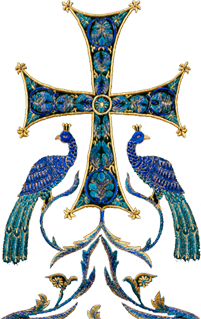 Hierarchs, clergy, and parish delegates met there to discuss the state of the Diocese and various affairs relating to Church life. 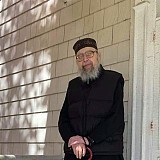 On Tuesday, October 16, the feast day of the Holy Hieromartyr Dionysios the Areopagite, marked the very first patronal feast day to be celebrated at the newly acquired monastery property of the ROCOR Brotherhood of St. Dionysios in St. James, NY. 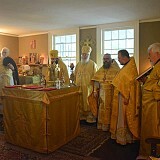 On Saturday the 13th and Sunday the 14th of October, the feast of the Protection of the Mother of God, His Grace, Bishop Jerome, led the patronal feast of Holy Virgin Protection Church in Nyack, NY. 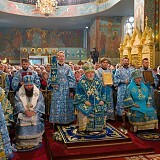 The Patriarchate of Constantinople does not have the right or authority to lift anathemas from the heads of Ukrainian churches, because that contradicts the canons of Orthodox Christianity. 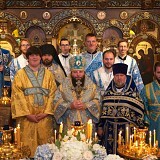 On Saturday the 6th and Sunday the 7th of October, Metropolitan Hilarion of Eastern America & New York, First Hierarch of the Russian Church Abroad, performed an archpastoral visit to the capital city of New York State to participate in and lead the 27th Annual Russian Orthodox Church Musicians’ Conference. 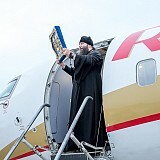 On Sunday, October 7, His Eminence Alexander, Metropolitan of Riga & All Latvia, co-served by Eastern American Diocesan vicar Bishop Nicholas of Manhattan, guardian of the Kursk Root Icon of the Mother of God celebrated Divine Liturgy in Nativity of Christ Diocesan Cathedral in Riga, were the wonderworking icon is currently visiting. On Friday, October 5, with the blessing of His Eminence Alexander, Metropolitan of Riga & All Latvia, the Kursk Root Icon of the Mother of God was brought to Lativa. 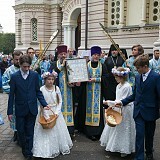 This is now the tenth visit of the great holy icon of the Kursk region – which became the Protectress of the Russian Diaspora in the 20th century – to the Metropolitanate of Kursk. when it came time for this year’s visit, I have to admit that I was a bit more relaxed and nonchalant in my journalistic approach. I thought to myself, "Since I covered the camp so extensively last year, there really should not be much for me to see this year." Needless to say, I was wrong. 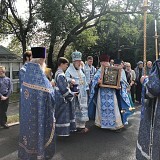 On September 29th & 30th, the annual Pilgrimage Weekend was presided over by His Eminence, Metropolitan Hilarion of Eastern America & New York. 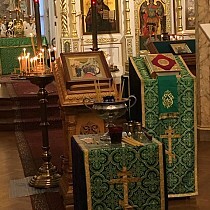 The monastery was greatly blessed with the presence of the Holy Myrrh-streaming Hawaiian Iveron Icon of the Mother of God, which arrived on Saturday afternoon and was greeted with the festive pealing of bells and incense.